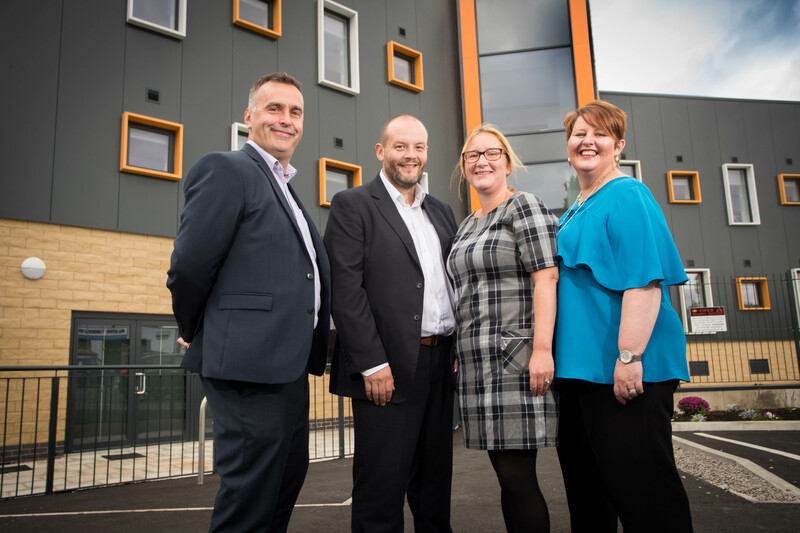 The Calico Group has officially opened its new, state-of-the-art complex needs homelessness centre in Lancashire, which will provide support and training to homeless and vulnerable people. Built by Ring Stones Maintenance and Construction on Mitre Street, the new £3.5m Gateway facility has been specifically designed for services that will improve people’s health and wellbeing and support people with complex needs through the delivery of integrated services. Gateway will also help to develop individuals’ skills and employability, and support them to move on to permanent accommodation. Pictured above from left to right is Anthony Duerden, Chief Executive of The Calico Group, Phil Jones, Managing Director of Calico Enterprise, Kate Cunliffe, Homelessness Services Manager, and Nicola Crompton-Hill, Director of Acorn Recovery Projects. Gateway will have a significant social impact, providing life changing services to some of the most vulnerable people across the North West who would otherwise struggle to find the support they need. As well as combining the expertise of organisations across The Calico Group — including Acorn Recovery Projects, Calico Homes and Calico Enterprise — to deliver services with purpose, imagination and passion, the team will also work in partnership with external agencies, including the Police and Inspire Drug and Alcohol Service. In total, Gateway contains 26 rooms, four direct access rooms and two disabled rooms, and a settled environment for residents to make positive changes to plan for their future and improve their way of life. The opening of Gateway follows the recent announcement of the Government’s Rough Sleeping Strategy, which aims to eradicate rough sleeping in England by 2027. Through the services delivered by The Calico Group, it is hoped that the opening of Gateway will go some way to helping to fight homelessness in Lancashire. Anthony Duerden, Chief Executive of The Calico Group, said: “We’re delighted to see Gateway finally open its doors. It’s a fantastic looking building, and we’d like to thank the team at Ring Stones for all the hard work they put in. “Gateway will deliver much-needed support with rehousing, health and employment that will provide a lifeline for some of the most vulnerable people in our community. It will be a vital resource for the area. Kate Heelas, Independent Living Services Manager, added: “At The Calico Group, we are passionate about helping the most vulnerable people in our communities, providing them with the support they need to lead a healthy and independent life.